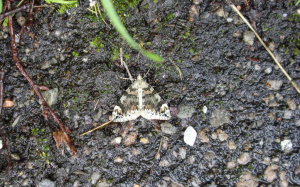 Observation - Carpet Moth - UK and Ireland. Description: Another moth that is causing me problems, I have scanned guides and internet and the best I can come up with is a Broken-barred Carpet. It was flying in daylight in mixed woodland. Help needed! Another moth that is causing me problems, I have scanned guides and internet and the best I can come up with is a Broken-barred Carpet. It was flying in daylight in mixed woodland. Help needed!